An alternative method of accessing your Smoothwall for administration purposes is to use a Secure Shell (SSH) console. From the Admin options page, you can control whether remote access is allowed. Note: SSH access is enabled by default upon installation. Upgraded systems where SSH is disabled, remain as such. 1. Go to System > Administration > Admin options. 2. Clear the selection for SSH. Note: Terminal access to the Smoothwall uses the non-standard port 222. 1. Check SSH access is enabled on the Smoothwall. 2. Start PuTTY or an equivalent client. 5. When prompted, enter root, and the password associated with it. You are given access to the Smoothwall’s command line. Optionally, you can add an information message shown to users after they have logged into their SSH session. Typical text may include warnings about editing configuration files. 2. From the Welcome messages panel, add appropriate text to the top box. 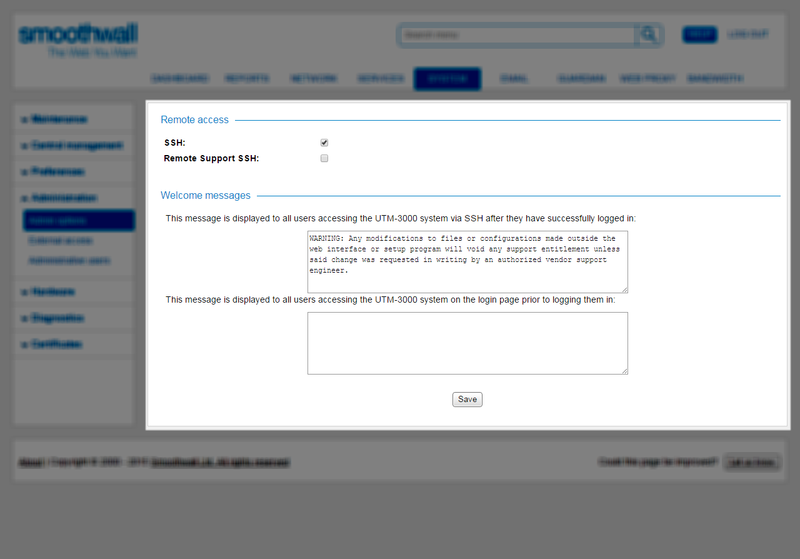 Optionally, you can add an information message shown to administrative users on the Smoothwall's login page (seeAccessing the Smoothwall ). 2. From the Welcome messages panel, add appropriate text to the bottom box. 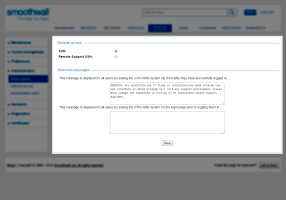 This parameter allows Smoothwall Support representatives to remotely connect to your Smoothwall for diagnostic purposes. Warning: Do not change the setting for this parameter unless requested to do so by a Smoothwall representative.